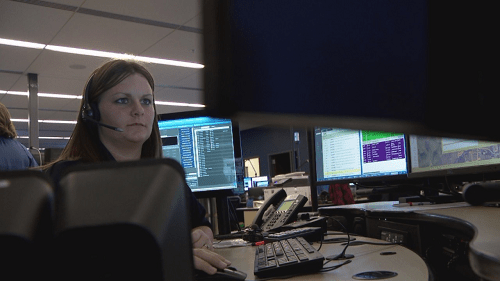 Copyright 2019 Scripps Media, Inc.
Public safety officials in Williamson County are using a type of technology that helps with emergency response. The Williamson County Department of Emergency Communications introduced RapidSOS to its system in February. RapidSOS gives dispatchers the ability to pin point the location of iPhone and Android users as soon as they call 911. Martini said it recently worked when a woman called 911 and whispered a faint call for help but quickly hung up before the dispatcher could get any information. Within six minutes from making the calling, officers located her at a fast food restaurant and helped in the situation. “With this technology we plugged that phone number into the Rapid SOS browser and placed her inside of a location of a fast food restaurant. We dispatched officers and within six minutes officers were on scene, found the caller and stayed there for 50 minutes or so,” Martini said. Dispatchers are able to pin point the location of the caller for about 45 minutes. The department is also advancing emergency response through a new software called ASAP-to-PSAP (Automated Secure Alarm Protocol to Public Safety Answering Point technology). Officials have been able to save about four minutes per alarm call, because the alarm system would directly connect to the Emergency Communications Center instead of the alarm company. The latest changes is accommodating a growing county and evolving department, which receives about 150 calls per day.